The palatal expander “expands” (or widens) your upper jaw by putting gentle pressure on your upper molars each time an adjustment is made. 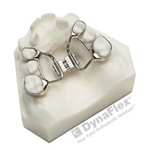 Dr. Gellerman will instruct you about when and how to adjust your expander. When you achieve the desired expansion, you will wear the appliance for several months to solidify the expansion and to prevent regression. Space opening between front teeth is the indication that the expantion is working. Your teeth will shift later to fill the gap.